Slippery Slope In Effect as Hawaii Begins Gun Confiscation Program — Condition Yellow: Stay Alert. Stay Alive. Hawaii is known for lush beaches, warm weather and an apparent hatred for armed citizens. A mere three months after Hawaii approved the opening of its first-ever medical marijuana dispensary in Maui, officials are now aiming to disarm residents that merely possess a medical marijuana card. Hawaii is one of 29 states that allow medical use of marijuana, but it is the only state that requires registration of all firearms. If you are familiar with the criteria that bar people from owning guns under federal law, you can probably surmise what the conjunction of these two facts means for patients who use cannabis as a medicine, which Hawaii allows them to do only if they register with the state. 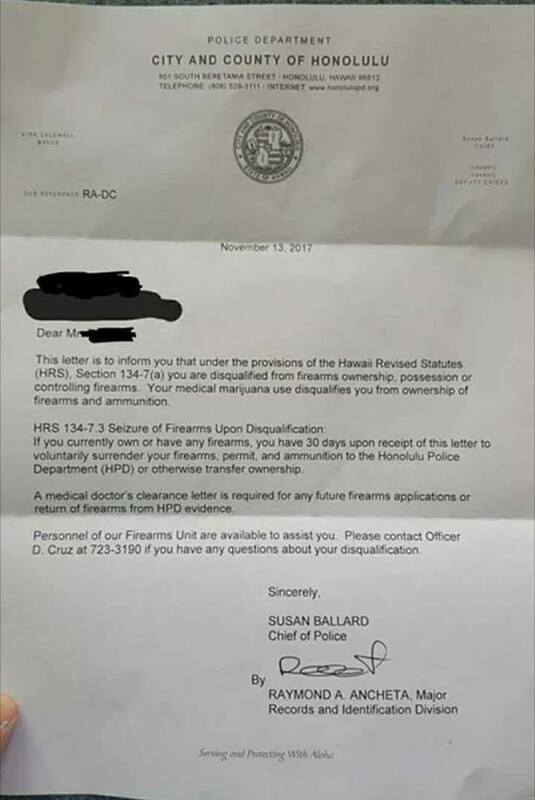 Some of them recently received a letter from Honolulu Police Chief Susan Ballard, instructing them to turn in their guns. Proponents of the Second Amendment have long opposed gun registration because of its 'slippery slope' nature. In essence, if the government knows who has guns, then the government knows where to go when it wants to forcibly disarm the populace. That time has come. For too long, anti-gun activists have labeled the slippery slope effect mere paranoid delusion. "The intent of gun registration is not confiscation," they said. Well, brace yourselves, Hawaii — the government is here to collect. Many state laws allow patients to medicate with cannabis, but the federal prohibition on cannabis consumption crosses that legality when it comes to firearms. The supremacy of federal law on this point was upheld last year by the 9th US Circuit Court of Appeals. This gun confiscation program, at minimum, is an encroachment on the Second, Fourth and Fifth Amendments. Depriving a person of his liberty to own or control a firearm first places the burden of proof on the state. Possession of a medical marijuana card is not proof that a person uses marijuana. Hawaii is making the case that every person that has one is a user of marijuana, whether or not they actually are — that is their basis for the program. Way to take a dump on your citizens, Chief Ballard. Every state in the U.S. has some type of law on the books that prohibits a person from possessing or controlling a firearm while intoxicated. If a person is observed leaving a restaurant that happens to serve alcohol, would Hawaiian authorities then declare that person intoxicated and strip them of their firearms? Of course not -- there'd be an investigation first. This is not the case here. Criminals neither care about gun nor marijuana laws. The only people affected by these new draconian measures is the law-abiding citizen, and if you think it can't happen to you, just you wait. Hawaii's got your name.